Touch-sensitive devices seem to be fast gaining momentum as far as popularity is concerned. Affecting all parts of the globe, Zebronics now brings these offerings to Indian soil dubbed as the ZebTouch touch panel mouse. According to the company, the device is observed to be the first-of-its-kind innovation in the country. The newly announced peripheral bears a space-age appearance and resembles something quite out of the ordinary. It has no scroll wheel or click buttons on the glossy surface. Offering a comfortable tactile feel, owners can simply control the actions by sweeping their fingers over the front of the device. 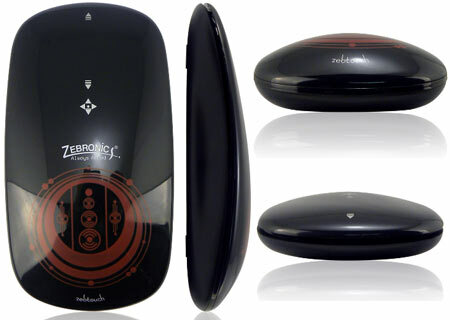 The trendy PC accessory sports a dark noir shade with markings on the surface. The company has further revealed that it will enhance its service network to reach around 100 centers strewn all across the country this year. They will feature both company-owned as well as Authorised Service Partner (ASP) models. At the Compass 2011 Expo, Zebronics also plans to reveal its new category of product line namely the power strip. The Zebronics Platinum series is touted to be India’s premier premium brand and is slated to include 100% copper as well as other quality features. As the company suggests, it looks towards offering its customers in India premium value products tagged with prices that won’t really eat right through their pockets.